If you have coughing, wheezing, and difficulty breathing much of the time, it could be chronic obstructive pulmonary disease (COPD). This inflammatory lung disease can be evaluated and treated by Nicole Kimzey, DO, at Girard Internal Medicine in Philadelphia. If you've been diagnosed with COPD or have symptoms that suggest it, call the office or book an appointment using the online tool. COPD causes obstructed airflow from the lungs. You experience serious difficulty breathing and produce an excessive amount of mucus. Usually, COPD is caused by long-term exposure to cigarette smoke or other irritants. COPD increases your risk of developing other serious medical conditions, including lung cancer and heart disease. You may have days that are worse than others, in which your symptoms become more severe. These intense episodes may go on for several days. Cigarette smoking is the primary cause of COPD, with 20-30% of chronic smokers developing the disease. Cigar smoke, secondhand smoke, pollution, and workplace exposure to fumes or smoke can also be responsible. Emphysema and chronic bronchitis are often precursors to COPD. For an accurate diagnosis of COPD, Dr. Kimzey does a thorough examination, medical history review, and review of your family history. She’ll discuss in detail any history of cigarette smoking or exposure you had to lung irritants. These tests can be used to test lung function, rule out other disorders, look for complications (including cancer), and confirm a COPD diagnosis. The best thing you can do to treat COPD is to stop smoking. Certain medications, both inhaled and oral, can also help relax the muscles of your airways and make breathing easier. Supplemental oxygen and pulmonary rehabilitation programs that involve exercise training, nutrition advice, and other lifestyle counseling can help you overcome many symptoms of COPD and restore your quality of life. 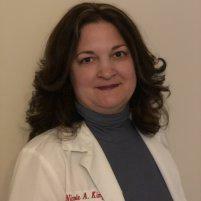 Dr. Kimzey works with you to create a treatment plan. To learn more about COPD symptoms, diagnosis, and management, call Girard Internal Medicine or book an appointment using the online tool.